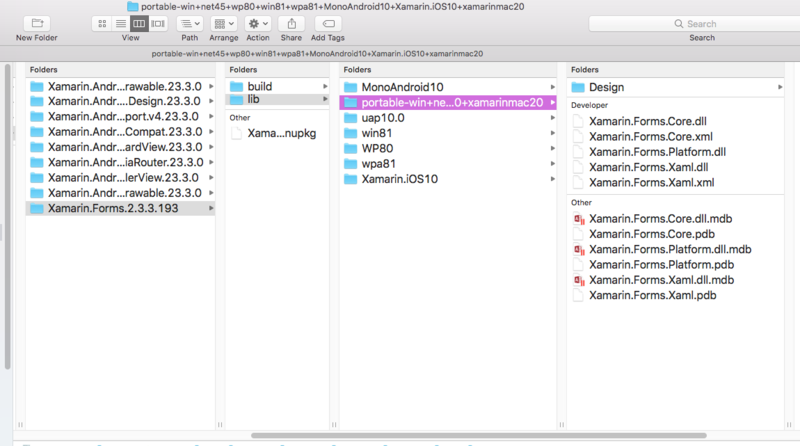 We just published our blog on Debugging Xamarin Open Source Frameworks: Xamarin.Forms. Please post any questions or comments here. After clonging the repo and changing the branch to 2.5.0 the .nuspec file looks good (without any win80, winRT and so on). I also tried to run nuget pack .nuspec/Xamarin.Forms.nuspec but without luck. Good question., and honestly I am not sure. Another thing is you may need to edit the .nuspec file to use forward slashes instead of backslashes. Or such is indicated in this thread. You need to copy the assembly and mdb/pdb files for all of the platforms you are using. Thanks very much for the blog post. It has been a big help. I am running into one thing, which I was hoping you might know what I've missed. I've cloned the 2.5.0 branch, and made a nupkg file. I created a new project using Share Project code sharing. Ran using the current Xamarin.Form official released package on iPhone simulator. All ran fine. Then I removed the official Xamarin.Form package and replaced it with the new nupkg file I had just created. "App.xaml.cs(9,13,9,32): error CS0103: The name 'InitializeComponent' does not exist in the current context"
Any ideas on what would help? Thanks. First I would ry to clean the project, even deleting the bin and obj folders in each project folder. I would also close and re-open the solution. Although it is possible to build Xamarin.Forms on a Mac via the command line, doing so would not build the UWP platform assemblies for Xamarin.Forms. As such, we’ll be using a Windows PC with Visual Studio 2017 for this post. I am interested in how this is done on a mac. I would love to be able to step though Xamarin.Forms on a mac, getting to that point seems totally mysterious to me, though. My dev machine is a mac, so that's all I have on hand. I don't have a Windows machine readily available. I work with iOS and Android only, so any platforms other than those aren't a concern. Where to begin? Search for lines with uap and remove all the lines/xml nodes referencing uap. Finally goto Visual Studio > Preferences > Debugger and disable the Debug project code only; do not step into framework code option. Fantasic - got this working, thanks!. One other small thing is that for some reason the debug symbols are not packaged for the Mac platform, so you'll need to edit the .nuspec to include the debug files as per the other platforms if you want to debug Xamarin Forms Mac. @JGoldberger in your article you suggest to fork instead of clone directly. Is there any advantage of forking if we want to contribute? because just cloning could be more beneficial in order to get updates by others and if want to switch between branches like today 3.5 or 4.0 beta branches. However it does seem in your scenario that a clone might be best. @JGoldberger getting updates seems to be working fine if you care only master branch because merge is only done by a single branch. it is cumbersome to sync each available branches. on the other hand i was trying other option mentioned here . it seems to be working for android but I am not able to step into UWP application which is more important for me because i plan to do more forking for uwp. Do you know if any special set up or settings required for uwp? That's the first I saw of Shane's post and that (seemingly easier) method of stepping into the Forms source code. So, no, I have no idea how to make that work for UWP. @JGoldberger when i try to run .create-nuget.bat all on Windows machine. it returns me errors as. Do you know why? I see you figured it out. Yes, Nuget.exe has to be where the script can find it, or you set the path to it in the script as you did. I not too long ago updated the blog post to cover this issue. The Forms team had changed the .create-nuget.bat since I first wrote the blog post. when i compare official nuget folder FormsViewGroup.dll and the one I created. official one has bigger size than mine. why does it create smaller? That literally overwrites the FormsViewGroup.dll with the text "foo". The script runs all of the echo foo > ... lines unconditionally. So I think you will need to rebuild that .dll. If the size of your .dll is 1K, then this might be the issue. I tried edited part of your blog post but unfortunately, alternative script also creates same as .create-nuget.bat all. Not sure what is going on. I might suggest avoiding that script, cleaning and rebuilding Xamarin.Forms from scratch and then using the nuget.exe pack ... command to make your package. hi @JGoldberger, i could finally fix the problem with the latest 3.5 source code. it works fine with android and ios but Uwp is not working. i can see that nugetpackage has pdb files included. do you have any idea what could be the reason? Is the problem in the building of the UWP Forms assembly? IOW does the build succeed without issue? Is the problem in the packaging? Are you getting valid Xamarin.Forms.Platform.UAP.dll in the nuget package?